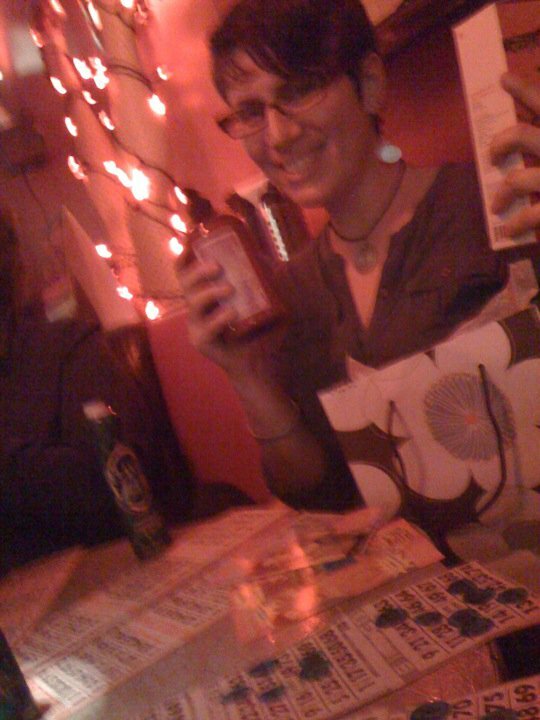 We were attending a bingo night benefit at the popular LGBT haunt. These “legendary bingo” nights happen at least twice a week all year long, benefiting charities of all stripes. The beneficiaries for this game were a couple of people who were preparing to ride in AIDS/LifeCycle, a 545 mile bike ride from San Francisco to L.A. to raise money and for the San Fran AIDS Foundation as well as the HIV/AIDS services of the L.A. Gay and Lesbian Center. This was definitely worth my 20 bucks. Hamburger Mary’s legendary bingo is not your grandmother’s bingo. I can attest to this having actually played bingo with my grandmother many years ago in Florida. No, the winning games here mostly contain raunchy sexual terms and innuendos. I won at “Frank and Beans” where the winning bingo card is in the shape of…well, frank and beans; and if you don’t get that, maybe you should stop reading now. The game is played like a showing of the Rocky Horror Picture Show with audience responses to the calling of various bingo numbers. For example, the drag queen choosing the bingo square calls out, “it’s not malignant, it’s…” and the audience responds “b-9!” Get it? That’s one of the more tame examples and was easy to remember. What did I get for my startlingly good luck? The prize was pretty fabulous. Some people got DVDs or gift certificates. I got bath products from a company called WEN. Yes! I love bath products. But winning bingo at Hamburger Mary’s is not all glitz and glory. The MC (Bingo Boy) forces every winner to run through the restaurant while the losers pelt her (or him) with their losing bingo cards. There have been times in my life when I might have been a bit too reserved to go with this and enjoy it. That time has passed. I had a wonderful time with all of my friends whom I saw during my brief visit, but playing bingo with my friend Nancy and a bunch of women I’d just met was easily one of the most joyful nights I spent in L.A. Thanks to Nancy for taking me along. After about six and a half days of L.A. – San Luis Obispo/Morro Bay – L.A., I finally have an opinion, however imperfect and spotty, of the city. I like L.A. and I want to go back…certainly before another 23 years pass. On my last day, the weather was warming up, the sun was out, and I was able to really enjoy the climate. I love warm weather. Recall my post from a few weeks ago and my relatively frequent trips to equatorial Africa? I am not a cold weather person. Then again I like the seasons and I can handle cold weather, probably better than most people in NYC. Is that a contradiction? Maybe, but it’s not as if L.A. is sunny and 75 degrees year round. There is variation, just not as much as in New York. The city also has far more to offer than weather alone. L.A. has a sleek, clean subway that reaches several major areas of the city, a pretty cheap and reliable bus system, charming houses, compelling history, the Church of Scientology (come on, you know you love it), much more non-glitzy “culture” than most people give it credit for, a diverse population, fantastic food, mountains, ocean, dessert, and lush tropical flora dotting almost every street. Parts of the city remind me so much of other places I’ve been and lived, including NYC, that I feel quite comfortable there. The drawbacks, apart from earthquakes and water use issues, are not that different from most major cities. So I will say it again; I like L.A. and will visit again in the near future because I’d like to have a more intimate relationship with the sparkling belle of Southern California. This was just our first date. I got up at 5:15 yesterday morning to catch the Rapid 733 bus from Mar Vista to Union Station in downtown Los Angeles. The bus took about 55 minutes. My primary journey was on the Amtrak Surfliner up the California coast to San Luis Obispo, a 5 hour train ride, to meet up with my friend Jay for 24 hours. The goal? Enjoy the view. On Monday, the day before my trip up the coast, I ventured into West Hollywood to lunch with my friend John at the Farmer’s Market, next to the Disney-like outdoor mall called “The Grove.” I had a shrimp taco at one of the permanent outdoor stands. The market, a rustic L.A. institution built during the first half of the 20th century, recalls New Orleans’ French Quarter in terms of the food offerings and the atmosphere, except that my shrimp taco, while good, was not quite as fabulous as a shrimp po-boy. I had taken the bus to get to my destination. I have found the L.A. bus system to be quite good, but I’ve really only taken the “Rapid” busses, i.e. the expresses, so I have a rather one-sided view. Still, they are clean, cheap – $1.50 for a Rapid – and the drivers are courteous. They are also rarely crowded, at least in comparison with NYC busses. It is possible to “do L.A.,” indeed to live here, without using a car. However, I can see why a car would be preferable. The bus is fairly convenient, but it can take awhile to get from point A to point B depending on where A and B are located. John rides a bike everywhere, avoiding main drags as much as possible. Out here, where cold rainy weather is far from the norm, that is a reasonable way to get around. After lunch I walked to Hancock Park and finally got to visit the famous Rancho La Brea Tar Pits. While this does appeal to me as someone who studies fossils, it also appeals to the child in me. 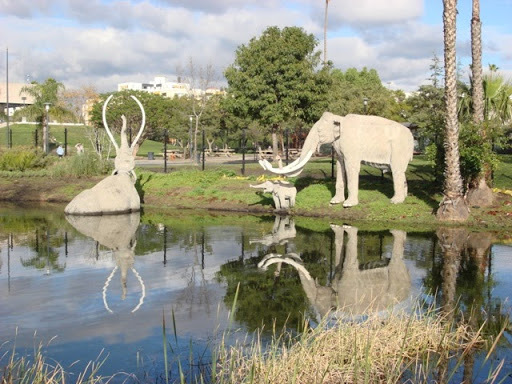 The tar pits are cool…plain and simple. The outdoor display of a mammoth family getting stuck in the tar, dramatizing how all of these creatures managed to become preserved over thousands of years, is corny, but I still loved it. Next to the mammoth family is the Page Museum where the fossils (or at least the casts) are on display. The museum is small, and a bit old, having been built in the 1970s, but the exhibits are not too out-dated. I do think that the short film explaining the history of the tar pits is in desperate need of revision, but the fossils are the reason to go there and really they are sufficient, at least for me. The other exhibits are decent and some even charming. 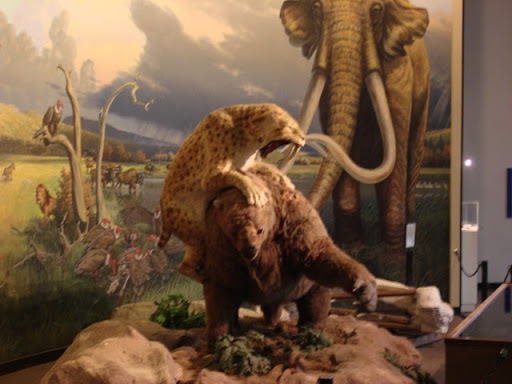 Who would want to do away with the animatronic saber-toothed cat attacking the giant sloth? It is such fun, if a little clunky. The fossils themselves are spectacular. I know of no other deposits where such phenomenal preservation has occurred. Granted, I am not, strictly speaking, a paleontologist, so there may be places of which I am unaware. Regardless, these bones are incredible. Complete skeletons exist, literally millions of bones representing thousands of individual mammals and birds. One display shows hundreds of foot bones from one eagle species. 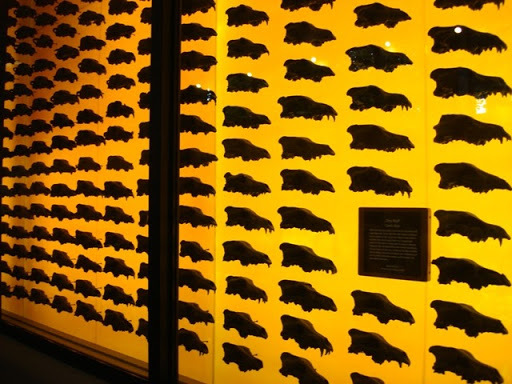 Another display shows hundreds of skulls from the extinct Dire Wolf. It allows us to see how much variation there was within one species. Where else can one see this in extinct animals other than trilobites? There is even a femur from a female human. I had not known prior to my visit that any human remains had been found in the tar pits. So I learned something new. The fossils at Rancho La Brea span tens of thousands of years, from about 38,000 years ago until quite recently. However, the most famous creatures, the saber-toothed cats, the American lions, the mammoths, mastodons, and giant sloths…they went extinct somewhere between 12,000 and 4,000 years ago depending on which species we are referring to. They were “Ice Age” North American megafauna, and they were indeed large. The lion was around the size of a modern Amur (“Siberian”) tiger, the largest of the extant great cats, and the Columbia mammoths could grow to about 13 feet tall. Obviously the “giant” sloths were massive. There is still no consensus as to why they all went extinct. Was it due to the arrival of weapon-wielding humans? Was it climate change? Was it some combination or something that we have not yet considered? We don’t know, but there are strong opinions on each side batted about in the academic literature. It is incredible to imagine the Ice Age megafauna here in California, existing in such large numbers. Humans are everywhere now and as much as I value our existence, I feel the absence of those glorious animals as I journey back down the coast. There are no pronghorn antelopes frolicking in the grass (though one species of pronghorn does still exist in North America), no mammoths grazing, no lions lounging under a tree, waiting for dusk. Maybe it is because I have spent time in Africa, where modern relatives of those mammals still live in a landscape that is in many ways quite similar to this one. Or maybe I just like to think about what it would be like to encounter a saber-toothed cat. Something fantastic is missing here. My route up and now back down the coast on The Amtrak Surfliner is popular with good reason, despite the absence of Ice Age megafauna, but I think we’ve established that my perception on this issue is a bit out of the mainstream. The train takes you along the Pacific coast, often right up to the water’s edge. On a clear day, which I am most fortunate to have, given the recent wet weather in SoCal, it is stunning. The only minor impediments to the eye are the oil tankers occasionally dotting the horizon. Beyond the tankers, and for a long stretch of the ride, are massive islands. I never knew there were islands off the Pacific coast. These remind me of the islands of Lake Turkana in Kenya. Increasingly, every place I go reminds me of someplace I’ve been and ultimately they all mesh together in my mind, which could explain my strange déjà vu on Monday evening. I was walking from the bus stop to a small market on Venice Blvd to pick up a few items in order to cook dinner for my gracious hosts, when I suddenly felt that I’d been there before, or somewhere like it. Though I could not place the source of the feeling, it seemed to be from a long time ago. I enjoyed the vague emotional recall. I wonder if someday, when I am old and senile I will subconsciously mix all of my travels together. Maybe I will condense them into one outrageous yarn, much to the delight of small children and strangers. Currently I am heading back to L.A. for my last evening before returning home. My trip to visit Jay was short but worth every moment of amazing food, breath-taking vistas and good conversation. His family lives near San Luis Obispo in a small town called Morro Bay. We lunched at a little Mexican spot called Mi Casa, which has excellent chips and fresh salsa, then drove out to an area south of town where we left the car behind and gradually hiked out to the beach. We wandered along the trail far above the water, watching waves crash dramatically against rocks down below, taking in the sweet scent of wild sage along the way. 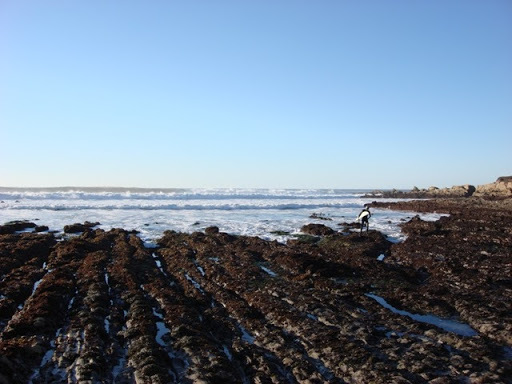 Eventually we climbed down the step-like shale to a small patch of beach filled with smooth stones, mollusk shells, purple algae, and even the rare abalone. 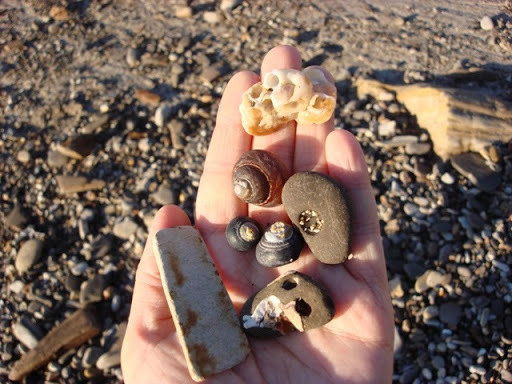 I made a small collection to bring home and marveled at the surfer who came in from the ocean wearing a helmet. Anyone who would brave those waves and sharp rocks must be intimately familiar with the tides and their underwater landscape. We made our way back to town just before sunset and headed out to Morro Rock to watch the last few minutes of daylight recede. Morro Rock is a giant formation that is slowly crumbling. Small boulders litter the ground and rock climbing is strictly forbidden, though of course someone makes a go of it every now and then. 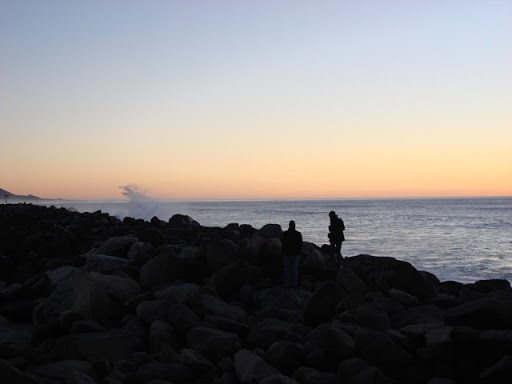 I snapped far too many sunset photos and got excited every time the waves crashed against the rocks. It is remarkable that something as formless as water can exert such force. I doubt I would ever tire of watching it happen were I to live in a place like that. For dinner we ventured back to San Luis Obispo. We ate at a restaurant called Big Sky Café where I enjoyed the onion soup with golden raisins. Think French onion soup without the cheese and bread, but with sweet soft raisins and a few croutons for added heartiness. It was exquisite. After a big meal and a hot cup of roobois tea, I slept well. I am sorry that I did not get a chance to thank Jay’s parents for their hospitality, but the entire excursion, train ride included, was a wonderful way to spend 24 hours. I did indeed enjoy the view.